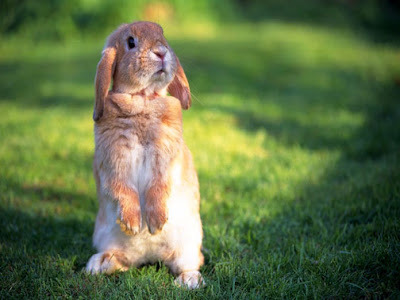 Rabbit Pet: Aggressive Rabbit Behavior - 4 Tips On Understanding Why And How To Stop It? Aggressive Rabbit Behavior - 4 Tips On Understanding Why And How To Stop It? Aggressive rabbit behavior is the pet rabbit owner worse nightmare.Why my lovely little friend has become mean and aggressive?What have I done wrong is our first question.There are 4 important things to remember in order to understand why this is happening. Let the rabbit out of his cage before you put your hands into it. Rabbits are territorial animals. If you let your bunny in his cage most of the time and you put your hands in it, he his likely to charge at you to protect his territory.Let him out before you intend to do any cleaning or else to it.If the cage only has a top opening,make him a side door so he can go in and out by himself. Spend time playing with your rabbit more often. This is unfortunate but a new pet rabbit is the center of attention when first came in. After a few months,you may have lost interest in him and left in alone a little bit more often everyday.Without a bond with his owner, some rabbits can become aggressive. Your rabbit need to be spayed or neutered. This is the most common situation. You got an adorable baby rabbit and by the age of 3 to 4 months old,he or she started to get rebellious.This is because when they become teenagers, rabbits can get territorial,maybe they start to growl, they resist being picked up ,and start to nip and bite you.But all they need really is to get spayed or neutered.Once they are their behavior change considerably and they really calm down. Something is causing your rabbit to be stressed out. There might be something causing your bunny to become an aggressive rabbit.Are they any other pets in the house? Dogs barking?Children trying to pick him up all the time?Or maybe loud music?Try to see what could be stressful for him.Maybe there is something you can do like putting his in a rabbit proofed room when you are gone instead of a cage. Providing him with more space will make your rabbit much happier. I hope this was helpful if you have an aggressive rabbit problem.There are a lot more tips I would like to share with you. Do you provide toys to your rabbit?See what the best are on my blog at http://www.petrabbitcare.blogspot.com , get free tips, see great videos and enjoy learning about your pet rabbit!